LRC: Men: In Debut, Gebremariam Makes Marathon Look Easy On a day that Father Time caught up to Haile G, another Geb, Gebre Gebremariam blitzed a 26th mile in 4:37 and took us back to an era when debutantes won and road racers won Falmouth and NYC in the same year, as a new marathon star may have emerge on the streets of NY. Meb Keflezighi finished 6th and Dathan Ritzenhein 8th. LRC Women: Edna Kiplagat Completes Magical Year, Shalane Impresses The women's race was perhaps the craziest one ever in New York as it was a 20 mile jog and a 10k race. LA Marathon champ Edna Kiplagat, American star Shalane Flanagan and half-marathon ace Mary Keitany battled over the final miles with Kiplagat winning and Flanagan battling back for second in her debut. The top 10 were separated by an amazingly small 1:35. *American 10k Record Holder Chris Solinsky Gets Wined & Dined In Elite Truck & Says "Maybe In 3 Years." 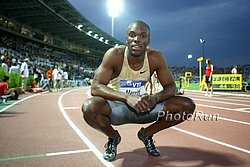 *Larry Rawson's Final Pre-Race Thoughts Rawson reveals that Haile G for the first time turned over hall business dealings for the final two months to associates so he could focus on training. LRC: Haile G's Retirement: Analysis Hearsay: Is He Really Done? We look at what led to Haile's retirement announcement, his prepartions for NYC, and whether the Emperor could change his mind. Either way, just one week ago Haile was saying if you even talk about retiring in 3-4 years you are done. Now he's saying he's done. LRC: Haile G Shocks The World And Retires After Dropping Out Haile G stunned the running world with his announcement. Immediate recap, reaction ,video and transcript. LRC: Meb, Shalane, Gebremariam And Mary Wittenberg React To Haile's Retirement Gebremariam: "I think in Ethiopia he has to change his plans. He has to continue to race. "While many are holding out hope this really isn't it for Geb his fellow runners shared how important he was to them. Mary Wittenberg doesn't want him to be 100% done. *Sports Illustrated: Gebrselassie Ends Storied Career In Stunning Style How about this writing!!! "Like Babe Ruth, who invented the homerun, Gebrselassie invented the modern distance world record." 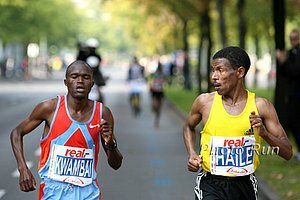 *NY Times: At Mile 16, Gebrselassie Ends His Race, And Career The article is full of great info, including the fact that Gebremariam says Geb must change his mind.